As seen on BBC Back to the Land with Kate Humble. 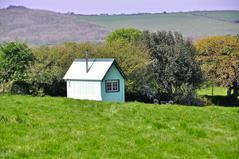 Tiny Tin House with mini kitchen, dinning area, snug, loft bedroom, wood burner & lake. Your private hot shower and toilet are a few paces away. Your cabin is set next to our lake within 30 acres of fields, woods and a little stream. The cabin boasts panoramic views and breathtaking sunsets. The cabin within ten minutes of Poldark's Harbour Charlestown, Eden Project, Fowey, Lantic Bay, Poldark's Bodmin Moor, gorgeous beaches and the Saints Way. This is a beautifully hand crafted Tiny House on wheels in a large field overlooking the lake at Green Cart Farm, a 30 acre working farm, gin distillery, perfumery and artisan Centre. The cabin is off grid solar and battery run. Your mini kitchen has stovetop cooking, a small sink and an ice box. There is a wonderful camp fire outside to sit by. Your boiler heated shower and camper cassette toilet is in a small hut a few steps away. The private parking is 200 metres away and we ferry you and your luggage across the field. 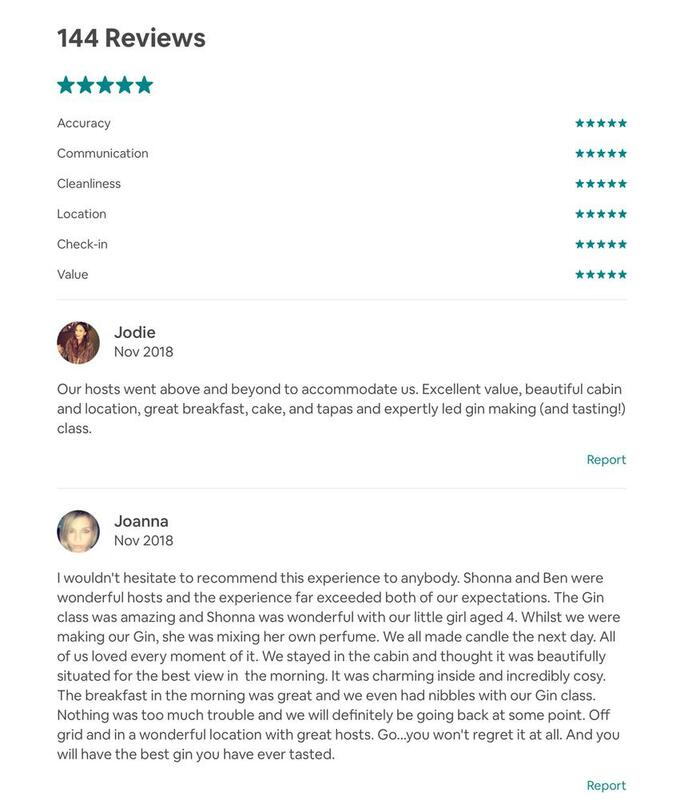 Your booking comes with a gin or rum designing and distilling workshop where you make your own bespoke gin to take back to your cabin 75 ml per adult guest. Children get to make a complementary dip and carve candle. Your cabin comes with a full breakfast and most essentials; bedding, duvets, quilts, sheets, tea, coffee, milk, salt, pepper, olive oil , ice, icebox, dishes, cutlery, pots, pans, utensils, shampoo, conditioner, soap, toothpaste, toilet paper and all cleaning supplies. * Bring a set of towels. You will have a supply of wood for the wood burner and a space heater for central heating. Cabin is fully insulated and wood burner must be put out in strong winds and at night. Cabin is ideally suited and designed for 3 guests. 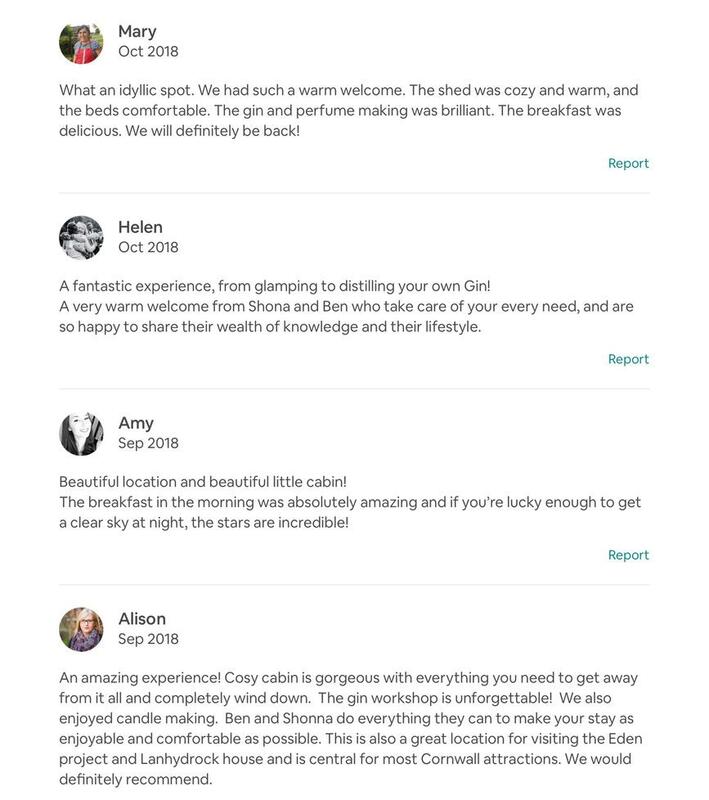 We welcome bookings of 4 guests but please note that the spare 4th bed is a small pop up single which takes up a lot of the living space when up and needs to be stored again in the morning.